The class of Sergio Garcia was never in doubt. But following his dominating win at the Omega Dubai Desert Classic this week, that same question is bound to be raised again: when will he finally win a major championship? The simple answer is: if he plays the way he did at the Majlis course for the four days, that is very much within the realms of possibility. Garcia was simply imperious at the tournament. He hardly put a step wrong, and if he made mistakes, he quickly rectified it. His ball-striking was brilliant, evident by the fact that he led the greens in regulations stat, and his famous short game was on song. The Spaniard was the complete package. When you have won so many tournaments, you also cannot be accused of not being strong mentally. Garcia, as well know and love, is an emotional person, but when it comes to golf, he is not weak-hearted. A lot of things go into winning a major championship. Luck and timing plays a huge role, unless you happen to be as blessed with talent as Jack Nicklaus, Tiger Woods or Rory McIlroy. Obviously, Garcia has also been a little unlucky that he is playing in the era of the last two mentioned. But Garcia is in a happy zone right now outside the golf course, and that is bound to show on his performance inside the ropes. Golf swing and form are dependent on so many different things that it is hard to keep everything intact over a protracted period of time. Hopefully, Garcia has found the secret of keeping it together for the foreseeable future. Stenson would be disappointed on not picking up his second Dubai Desert Classic trophy, but his early-season form is pleasing. For the past few years, he seemed to struggling in the Desert Swing a bit, but that was definitely not the case this year as he finished inside the top-10 in the Abu Dhabi HSBC Championship, and runner-up here now. One of the biggest success stories of the week, undoubtedly, was the 17-year-old Dubai-based amateur Rayhan Thomas. He qualified for the tournament by merit as the Amateur Order of Merit winner of the MENA Golf Tour, and cemented his place as the poster boy of the Tour by becoming only the second UAE-based amateur to make the cut. There were three phases in the tournament when his world-class potential stood out. The first when he showed absolutely no nerves in his opening round four-under par 68. The second was when he made played his first three holes of second round in par in howling wind conditions. And the third when he made at least three crunch putts on the back nine on Saturday to ensure he made the cut after a terrible start to his remaining second-round holes. The home-grown star has given the MENA Tour, and the UAE golf fans a lot to cheer, and he is surely the one to watch for in the future. Also deserving of applause during the week was the superb work by the maintenance staff of Emirates Golf Club. Following the high winds that forced suspension of play on Friday, that uprooted trees and blew tonnes of debris on to the greens and fairways, Craig Haldane and his team somehow managed to work through the night and when play resumed on Saturday, the course looked spick and span. With the tournament, another successful Desert Swing has come to an end. Here’s looking forward to the next year. 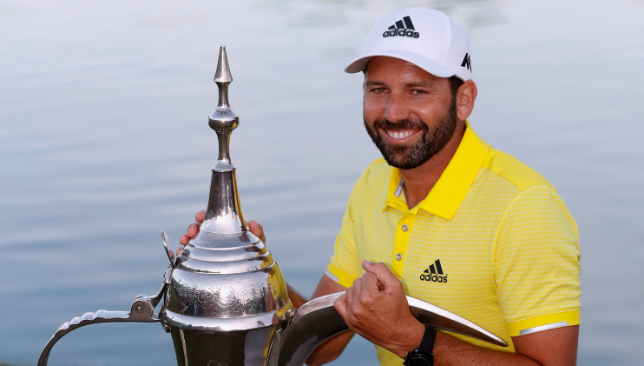 Spain’s Sergio Garcia moved back into the top 10 in the world after leading from start to finish to claim his 12th European Tour title, and first for three years, in the Omega Dubai Desert Classic. Garcia carded a flawless closing 69 at Emirates Golf Club to finish 19 under par, three shots clear of Ryder Cup team-mate Henrik Stenson. Stenson birdied the last to complete a 69 and finish 16 under par, two shots ahead of England’s Tyrrell Hatton and Denmark’s Lasse Jensen. Ian Poulter, who was in the final group alongside Stenson and Garcia, struggled to a closing 76 to finish tied 15th. Over the past few years, professional golfers around the world have found out that it is rather difficult to beat Henrik Stenson, particularly when he hits as many as 79 per cent greens in regulation in a tournament. That was the Swede’s tally at the Majlis course, but at the Omega Dubai Desert Classic, he had to settle for the bridesmaid’s role against another supreme ball-striker, Sergio Garcia. The Spaniard was a popular winner, leading from the start to the end, and never looked threatened even as Stenson made his move on the final day. Starting the day leading by three shots, the only way someone could have reined in Garcia would have been if he made mistakes. But showing steely resolve in a tournament where he never finished inside the top-10 in his seven earlier appearances, the 37-year-old fired a bogey-free round of three-under par 69 for his 12th European Tour triumph. World No4 Stenson finished second at 16-under par after submitting a card of 69 himself, but he faltered at a crunch moment in his battle against the world No15, who is now expected to rise to No9 on Monday. There were two key moments – the first came when Garcia saved a stunning par on the eighth hole after pushing his drive into the desert, and the second when Stenson lost his momentum with a bogey on the par-3 15th hole. Garcia started the day with a birdie on the first hole, but Stenson restored the original gap with one of his own on the sixth. On the eighth, it could have been disaster, but Garcia hit a superb second shot from the dirt, and made his par. “Obviously, eighth was a big moment for me. Maybe, because I was in pretty good control. I was 1-under, fairly easily through the first seven, and not really missing many shots,” said Garcia. “And then I hit that terrible drive. To be able to save par there was big mentally. Even though I hit such a poor drive, that par save was probably better than if I would have hit a good drive, a really nice iron shot to 12 feet and two-putted. It was like a little boost. With a birdie on ninth, Garcia again increased the advantage to four shots over Stenson, who replied with three birdies and a bogey in five holes after the turn to close the gap to two. On the 15th, Stenson overshot the green and failed to make his up-and-down for par, whereas Garcia hit a stunning tee shot to two feet and made a birdie for a two-shot swing. Stenson, who won the tournament in 2007, said: “Obviously I was chasing all day and I was trying to push, even though I didn’t play my best. “With that birdie on 14, I was hoping I was going to be able to make it a bit interesting coming into the last couple of holes. If you’re one or two behind, with 17 and 18, a lot of things can happen…you can eagle and someone else can end up in trouble. Denmark’s Lasse Jensen shot the lowest round of the final day – a seven-under par 65 – to climb to tied third place with England’s Tyrrell Hatton (67).